You can tame some animals, simply. You can tame animals now, that's it. 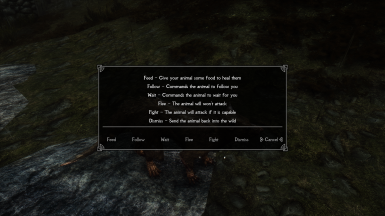 This isn't some elaborate follower mod where you can cuddle your pet Sabre Cat, this is a mod where you can recruit that troll over there to help you get through some dungeon. To tame an animal you simply have to be sneaking, activate an animal, and try to give it some food. Prey prefer leafy greens, predators prefer huge chunks of meat. The chances for success are dependent on your character's Speech skill, and the animal's level; it will be easier to tame a rabbit than it will be to tame a Cave Bear. It will also be easier to tame an animal if it isn't trying to eat you. So being skilled in Illusion, knowing the Kyne's Peace shout, or using the Wood Elf racial ability will help. You can tame up to five animals at once.